Helen Simons, PsyD, has never been a patient of National Jewish Health. No one in Helen's family has been a patient either. Yet both Helen and her parents believed it was important to give to the hospital. "I give because National Jewish Health is an organization that does great work," Helen says. "I gave a charitable gift annuity because the money eventually goes to National Jewish Health, and in the meantime, I don't lose the dividends or interest." Helen has always been very generous and service-oriented, especially when it comes to children. She began teaching Sunday School at a Chicago-area temple when she was just 14. She cared for her two children while completing her postgraduate studies. She then served as a school psychologist with Chicago Public Schools for 36 years, retiring at the age of 80. "I loved working with the children," she says. "I belong to a people who are interested in learning, teaching children and helping support the health and welfare of others," Helen says. That common Jewish philosophy is what helped National Jewish Health Founder Frances Wisebart Jacobs build a hospital for destitute individuals suffering from tuberculosis (TB). 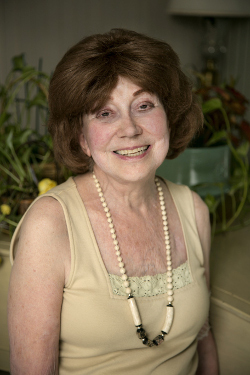 The Jewish community supported Frances in her mission of health and welfare. In 1899, with funding from the National Jewish B'nai B'rith organization, the nonsectarian hospital received its first patient under its official motto: "None may enter who can pay—none can pay who enter." She named the hospital National Jewish in gratitude. From its earliest days, the institution has given special care to children. During the TB outbreak, the hospital housed healthy but impoverished children so they could receive medically supervised food and exercise. Today, National Jewish Health is the only medical campus in the country with a school for chronically ill children. This unique place is a free K-8 day school for children diagnosed with diseases, including severe asthma and allergies, cystic fibrosis and immune deficiencies, including HIV/AIDS. It provides a safe, friendly and healthy educational environment committed to the academic, medical and social success of the students. "It is a most worthwhile organization," Helen says. "That is why my family always gave to National Jewish Health and why I have always given." Through her charitable gift annuity to National Jewish Health, Helen is supporting her life-long love for giving and improving her financial security. This type of gift provides her regular income and various tax benefits while helping National Jewish Health further its mission to heal, to discover and to educate as a preeminent health care institution. You can follow in Helen's footsteps and give a gift that pays you back. To learn more about supporting National Jewish Health with a charitable gift annuity or other life income gift, contact Gordon Smith, MBA, CFRE at giftplanning@njhealth.org or 1.800.423.8891, Ext. 6549.